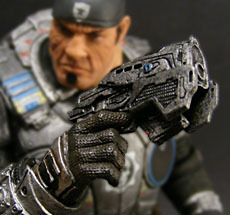 With their Gears of War action figure line, NECA isn't exactly striking while the iron is hot; Gears dropped in November 2006, and even Halo 3 and its subsequent McFarlane toyline has come and gone (figuratively speaking) since then. However, Gears of War 2 hits this fall, so I imagine these figures will find plenty of collector enthusiasm. If you're curious about my thoughts on Gears of War the game, you can read my review. Today I'm just going to be talking about the action figure. Son of the famed military scientist Adam Fenix, Marcus established a reputation as a brilliant soldier during the Pendulum Wars, earning numerous field promotions and decorations. He was on a fast track to an outstanding military career until the war with the Locust Horde. When the Horde breached Jacinto Plateau's defenses, Marcus defied orders to save his father, who was under siege at East Barricade Academy. He was too late. Marcus was charged with dereliction of duty and was sentenced to 40 years in Jacinto Maximum Security Penitentiary. Four years into his sentence, the Horde overtook the penitentiary. Marcus was rescued by his best friend Dominic Santiago, so that he could rejoin the fight against the unstoppable Locust Horde. Marcus stands about 7⅛" tall, putting him in line with most of NECA's figures. The sculpting is great, but what impresses me even more are the paint applications. The grimy wash on the armor is very well applied, and they found just the right shade of blood-rust red for the Lancer rifle. The detail work on the various tiny graphics and icons on the armor - such as the "Skull Gear" image on the chest - is nothing short of amazing (or they may be decals or decoupage, I'm not certain). The only bit that isn't perfect is the somewhat gloppy work on Marcus's hair. NECA has recently wowed fans of articulation with their Teenage Mutant Ninja Turtle and Raziel figures, but the company seems to pick and choose which licenses get the works. 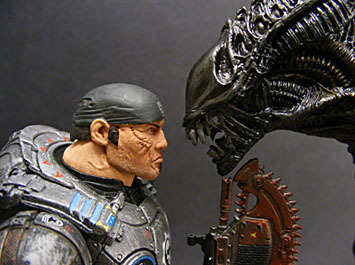 Even different figures in the same line might get differing articulation; the Alien Warrior in their Alien vs. Predator: Requiem line had excellent articulation, but the Predator from the same line was rather pre-posed. The amount of articulation is often tied to how well it can be integrated into the sculpt. 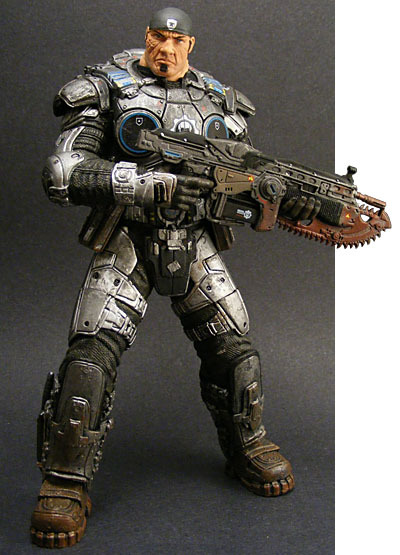 Since the soldiers of Gears of War are classic examples of the gigantic, beefy types Epic Games is known for in their games (such as Unreal), extensive articulation probably would have hindered the sculpt (and besides, in that get-up, there's a limited number of poses Marcus can get into anyway). So while Marcus does feature the all-important balljointed neck, as well as balljointed shoulders, hinged knees and what appears to be swivel-hinge wrists, everything else is a simple swivel joint, including the elbows. Disappointing. Marcus comes with two accessories: his Lancer - the game's iconic "chainsaw gun" - and a pistol. In the game, the pistol can be holstered on Marcus's back, but there doesn't seem to be an attachment for it here (you can squeeze the gun in between the pockets of his belt and it'll stay perfectly). He also has a knife in a leg sheath, but it isn't removable, and thus we don't count it. Be careful with the Lancer. It can be tricky to fit Marcus's left hand into the grip above the chainsaw, and if you're not careful you might break the blade. Also, the rifle has a tiny swing-out handle attached to the left side, which apparently is used to stabilize the weapon while you're chainsawing a Locust's face off (I never noticed it in the game, but that may have been due to all the blood splattering across the screen). The handle pops off really easily, so beware of it getting lost somewhere. While I would have preferred more articulation on Marcus (according to a NECA spokesman, Epic Games insisted on as little articulation as possible), he's still a great figure. But at $15 or so for a specialty figure like this, these purchases are getting harder and harder to make.